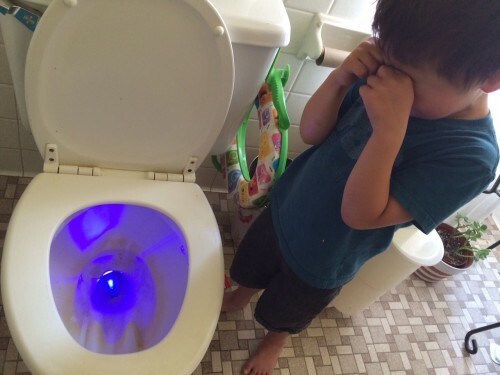 This was my Father’s Day highlight… working with an inconsolable Arlo to build a device capable of retrieving his “laser” from the toilet. Linette was in Florida this past weekend, and I just hung out with the kids. We ran around the sprinkler, hung out at the local pool, cooked out with neighbors, and stayed up late watching science fiction movies and eating nachos. I know, as a father, I’m supposed to say that the best Father’s Day present would be just a little peace and quiet, but I genuinely enjoyed the chaos these past few days with the kids, even with the inevitable sweaty melt-downs that come along with the first 90-degree temperatures of the year. This entry was posted in Mark's Life and tagged 6th grade, Arlo, Fathers Day, parenting, parenting advice, things dropped in toilets, toilet. Bookmark the permalink. Post a comment or leave a trackback: Trackback URL. It’s like one of those investigative news specials where they go into a motel room with a black light to look for blood, feces and sperm. I think I would have just reached in and pulled it out. He wipes with a laser? This kid is headed places. LOL! Brings me back to when my boys were little and would put little plastic toy boats in the toilet to see what would happen…and, would cry hysterically when they disappeared. Are you suggesting copyright infringement, Elizabeth? I thought you guys were installing a BOWL-GLOW that I saw on the TV! I love everything about this. Happy belated Father’s Day! I suggest going to either GFS to get a box of food service gloves or the auto store to get a box of sized nitrile gloves. They are all disposable to accommodate germaphobia, and handy for many things. I use them whenever I work under the hood of my car. No more grimy fingernails or greasy residue in sinks. He told me there was a rainbow in his toilet!!! Love that kid!! But does it still work??? You’re out of toilet paper.